Silky white chocolate cream dessert served with macerated raspberries, a dark chocolate sauce and a ginger spiced biscuit. Soak the gelatine leaves in cold water until they are soft. Break the chocolate into small pieces if necessary. Place the milk and cream into a saucepan, grate in the tonka bean using a microplane grater. Bring to the boil and then add the softened gelatine leaves. Stir to dissolve the gelatine. Pour the cream and milk onto the white chocolate pieces and stir until the chocolate is completely melted and evenly distributed. Pour the liquid into heatproof glasses or plastic moulds and place in the fridge for a couple of hours or until set. Place all of the biscuit ingredients in a bowl and mix to the consistency of a dough. Form into a ball and then roll into a cylinder using cling film. Refrigerate for half an hour to allow the mixture to become firm. Once the mixture is firm, remove the cling film and cut the dough into 1cm thick slices. Transfer to the oven and bake at 180'C for 10-15 minutes. Once baked, remove from the oven and allow to cool. Place the double cream and the milk in a saucepan and bring to the boil. Break the chocolate into small pieces and then pour the cream/milk over the top. Whisk until the chocolate has melted and you have a smooth and shiny sauce. Place the raspberries in a bowl and stir in the icing sugar and Grand Marnier. Stir and allow the fruit to macerate for a half an hour. This will release the juices from the raspberries. Fill a shallow pan with water and bring to the boil. Dip the panna cottas in the water for 15 seconds and then run a small knife around the edge to release the panna cotta. 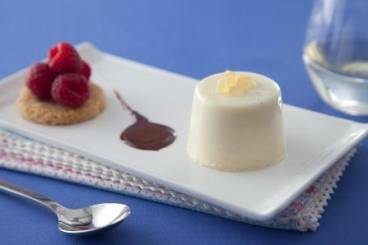 Turn the panna cotta out onto a plate. Finish the dessert with the raspberries and juices, a drizzle of the chocolate sauce and serve the biscuit alongside.